Sloane Price had decided to end her life. Her sister ran away six months ago and left her with her physically abusive father and she has nobody left in the world. On the day she decides to kill herself, the world as we know it comes to an end. All of a sudden the dead do not stay dead–they rise again to infect the living. Sloane ends up with a group of her peers taking shelter at their high school. However, while all of the other teenagers are fighting for survival, Sloane is just awaiting the moment when the living dead break down the barricades and finally end her life for her. This is Not a Test is a book about the zombie apocalypse, but it is also about so much more than that. I picked it up because I had heard good things about Courtney Summers and I am a HUGE fan of zombie stuff. I am pleased to say that I was VERY impressed with this book. While this is a zombie book, the zombie apocalypse is really only the setting for a much deeper story. There are scary and suspenseful moments while the kids are all hiding out in the school or running from zombies, but this book also deals with so many deeper issues. Sloane has been abused by her father for years and the only person she was able to rely on was her older sister. When her sister ran away it left her feeling abandoned and betrayed and she no longer saw a reason to live. This book is about survival, but yet Sloane doesn’t actually want to survive. However, the five people sharing her shelter desperately do want to live. They all soon come to realize that while the greatest threat outside may be the zombies, the greatest threat inside is actually each other. I cannot say enough good things about this book. Courtney Summers has a writing style that is absolutely incredible. After I read this book I decided that I had to read everything else she has ever written because I admired her writing so much. The pacing in This is Not a Test is perfect, the characters have their own individuality and depth, and the overall story is so moving. Throughout the whole book, Sloane is trying to figure out what her reason is for surviving against the odds and where she actually belongs in this new world. I couldn’t put this book down because I was so anxious to find out if Sloane would finally discover her will to survive. I highly recommend this book, even to people who normally don’t like zombie books, because the story is really so much more than just that. 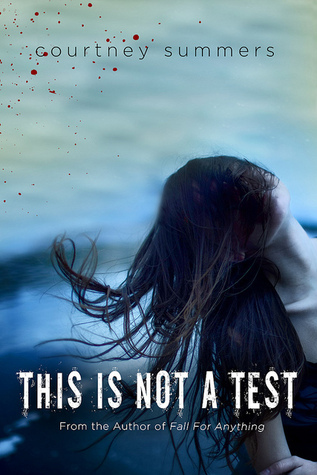 This is Not a Test was released on June 19, 2012 and is a standalone novel.